Influential character designer, producer and director Bruce Timm helped change the face of superhero animation when he shepherded "Batman: The Animated Series" (Fox, 1992-95) to phenomenal success. A frustrated comic book artist, he turned to animation, getting his career start as a layout assistant on cartoons like "He-Man and the Masters of the Universe" (syndicated, 1983-85). Eventually landing at Warner Bros. Television Animation, Timm lent his talents to "Tiny Toons Adventures" (syndicated, 1990-92), before being put in charge of the game-changing "Batman" series. Soon the doors to traditional comics opened as well, allowing the artist to contribute to several books, including the award-winning "Mad Love" issue of The Batman Adventures in 1994. 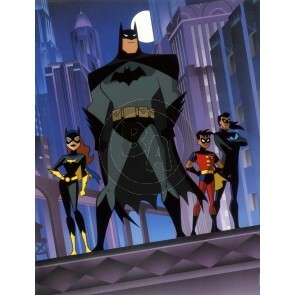 Much in demand, Timm went on to helm "Superman" (The WB, 1996-2000) and "Batman Beyond" (The WB, 1999-2001). He further expanded the scope of the animated superhero landscape with the series "Justice League" (Cartoon Network, 2001-04) and direct-to-DVD movies like "Justice League: The New Frontier" (2008). As the live-action comics-to-film craze reached its zenith during the first decade of the 21st Century, Timm and his fellow animation collaborators enjoyed the satisfaction of knowing that it was their groundbreaking work years earlier that was largely responsible for paving the way for mainstream acceptance of the beloved genre.